In lieu of the formal readings or traditional vows, why not take a few liberties to personalize your ceremony and make it uniquely you? Write and read your own vows to one another. You can structure them by including all the things you fell in love with, why you are thankful for one another, and what promises you make to one another. There are several great books you purchase with creative ideas on writing meaningful and original vows. My sister has an incredible voice and she sang to her husband at the alter. It was beautiful and breathtaking. There wasn't a dry eye in the house. Coordinate with your officiate to have all of the married couples in attendance stand. Have them sit in increments of those married less than 5 yrs, less than 10 yrs, 20 yrs, etc ... until you are left with one couple standing who has been married the longest. I was at a wedding where the couple had been married 63 years. Everyone applauded them and the officiate challenged the couple to reach that goal and to look as happy, healthy, and in love at that age. It was incredibly touching. Include the story of how you met in your ceremony. Your guests will appreciate sharing in your love story. At my own wedding, rather than decorating the chapel with flowers, each female guest was given the symbol of love, a single red rose. The ushers presented them from large vases at the entrance as they were seating each attendee. Greet guests with music as they arrive at the ceremony. A traditional string quartet is beautiful, or you can be original with an acoustic guitar or even mariachis! Place something in each seat for your guests. Rice or confetti to toss after the vows, is a great touch. Wedding bubbles are always popular too. You can really set a festive tone with party poppers filled with streamers for the guests to unleash after "I Do"! 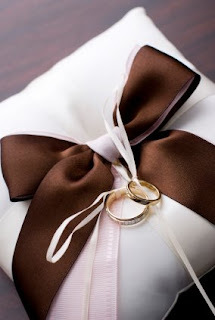 Check out WhereBridesGo.com for creative wedding boxes, pouches, and personalized gift tags for your guest goodies. Do you have unique idea for your wedding? Share it with us! We would love to read and share what you are doing to make your wedding creative and original! Visit WhereBridesGo.com for wedding supplies and wedding favors. FREE shipping on all orders over $100. Take 10% off your entire order with coupon code BLOG. Good suggestion for choosing the best groomsmen gifts. Yes its very true that a successful wedding ceremony depends on the love between both of you. Don't forget the impact of a well delivered Best Man speech rather than some semi-sober ramblings.